The Arnewood Sixth Form has received official recognition for being among the best in the south-east for three A-level subjects. The Arnewood Sixth Form is celebrating three of its A-level subjects being highlighted as producing among the best results in the south-east. 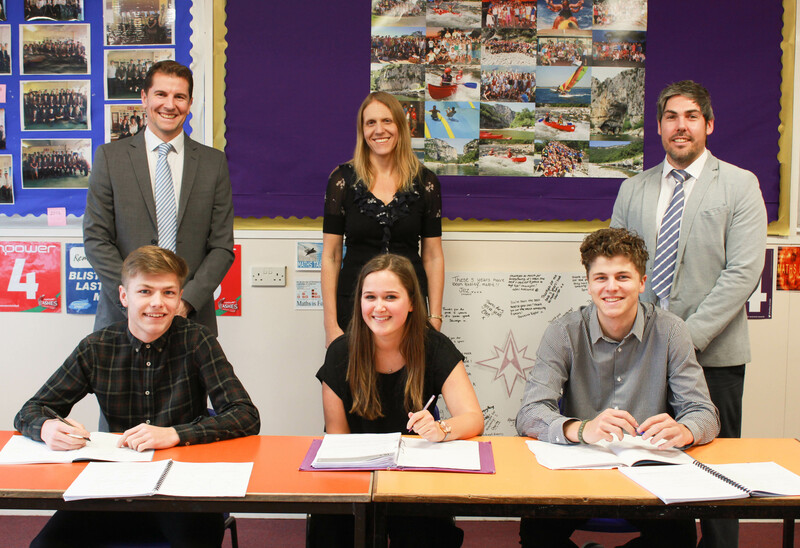 Pictured: Back row, from left to right Head of Sixth Form, Mark Colman, Fiona Nation (psychology), Simon King (maths). Front row from left to right students Jake Fields, Daisy Sheppard, Rafferty Hussey. Arnewood features in the prestigious ALPS (A Level Performance Systems) Directory, which highlights schools that have been ‘consistently strong’ in their teaching and examination results. The sixth form has been highlighted as having some of the best results in the south-east of England (including south London), in maths, psychology and law. For both maths and law, Arnewood scored a Grade 2, which means the results are officially ‘outstanding’ and places it in the top 90-99 percentile. In psychology, the school received a Grade 3, which is an ‘excellent’ rating and means its average results from the last three years puts it in the 75–89 percentile. The ALPS A Level Directory of Good Practice 2017 was created using data provided by schools across the region. It can be used to identify providers with consistently strong and rapidly improving departments to enhance collaboration between schools, colleges and academies. In 2017 Arnewood saw 100% of its students secure the A* to E pass grades, with more than one in five students (21%) achieving A* to As across the board and more than half (52%) receiving A* to B grades.